There’s no other area of the Outer Banks that is like Roanoke Island. Come and enjoy the history and mystery of the Island and yet be so close to the world class beaches of the Outer Banks. Enjoy the many amenities of a walkable village that is home to many wonderful restaurants, museums, art galleries, artist studios, shops, and museums. The restored and lovely waterfront and downtown area is an attraction in itself, with local boats sitting in Shallowbag Bay and the surrounding boardwalk with docks. Catch a sail on one of the restored boats, and enjoy the waterfront without a car--blend in with a bike! Then: why not stay in The Island Loft ? Enjoy two beautiful bedrooms, full kitchen, spa shower, furnished private deck, and comfy living room with all the amenities of a high end loft apartment. You are within walking distance to the ever popular Manteo Waterfront where you will find all types of activities for all types of families. Enjoy the fun restaurants, museums, great shops, and art galleries with artists in residence. Come and to the Loft and enjoy all the Roanoke Island has to offer. Very cute and cozy upstairs loft with private entrance. This was a great place to stay for our short getaway vacation. It was walking distance to a brewery, distillery, restaurants, shopping, and beautiful views. It was a short drive to the public beaches, delicious restaurants, and historic highlights. For two couples, comfortable seating in the livingroom was limited but besides that this was an ideal home to stay. Thank you so much for opening your home to us, we really enjoyed everything!! The Island Loft is an amazing place to relax and destress. Very cozy and quiet. 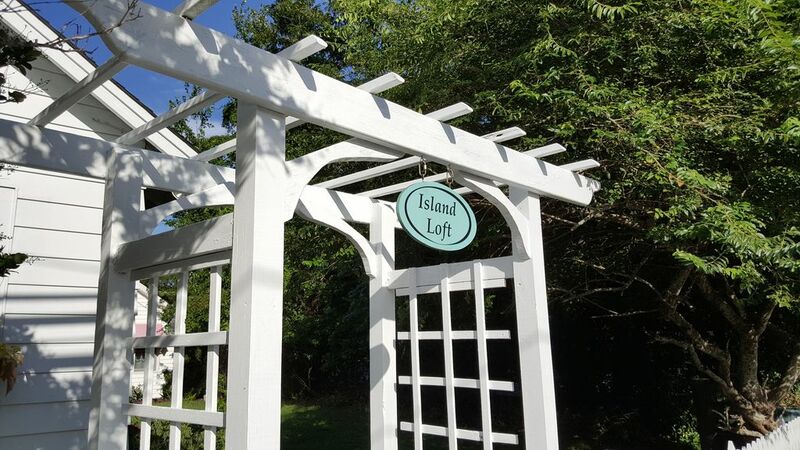 Conveniently located to the waterfront with plenty of things to do and see within walking distance. We plan on returning next year. This place is a gem! Loved it! Loved the location as well! Would stay here again! Very nice, well kept and clean! My husband and I enjoyed the deck! Our daughters enjoyed being able to walk to shops! Loved it! Would recommend to friends and family. The location is convenient to the waterfront. The apartment is very clean and quiet. We liked the antique-look light fixtures. A great place for a weekend in Manteo. The loft is a lovely space tucked above the historic Neva Midgett house. The kitchen includes all the trappings of home, the bathroom is fully stocked with fluffy towels and facecloths, and the beds are so comfortable, you feel as though you are sleeping on clouds. We walked everywhere we needed to go on the island and even made friends with some of the locals at the public marina. Manteo is always so accommodating and pleasant, and I highly recommend this rental and plan to come back again soon.